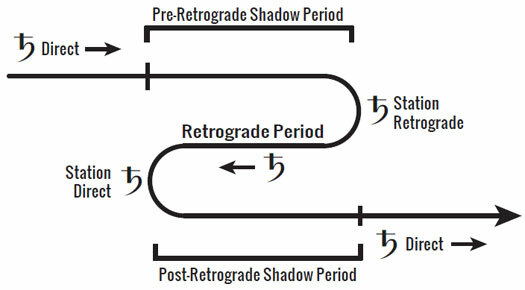 In astrology a shadow period is defined as a specific period of time that occurs both before and after the retrograde period of a planet, starting when the planet first passes the degree of the zodiac that it will eventually retrograde back to, and ending once it eventually passes the degree that it originally stationed retrograde at. Shadow periods are sometimes referred to as retrograde shadows, or shadow points. The concept was first defined by astrologer Roxana Muise in the 1980’s, and since then it has gained a moderate to wide degree of acceptance and usage in the astrological community. From an interpretive standpoint shadow periods are important because they are essentially seen as extending the operational duration of the retrograde period of the planet. Instead of the retrograde period beginning on the day that the planet stations retrograde, the events and circumstances associated with the retrograde are seen as beginning to develop as soon as the planet passes the pre-retrograde shadow point, which is the degree that the planet will eventually retrograde back to. Similarly, instead of the retrograde period ending on the day that the planet stations direct, in this context the circumstances surrounding the retrograde are seen as continuing until the planet passes the post-retrograde shadow point, which is the degree that it originally stationed retrograde at. 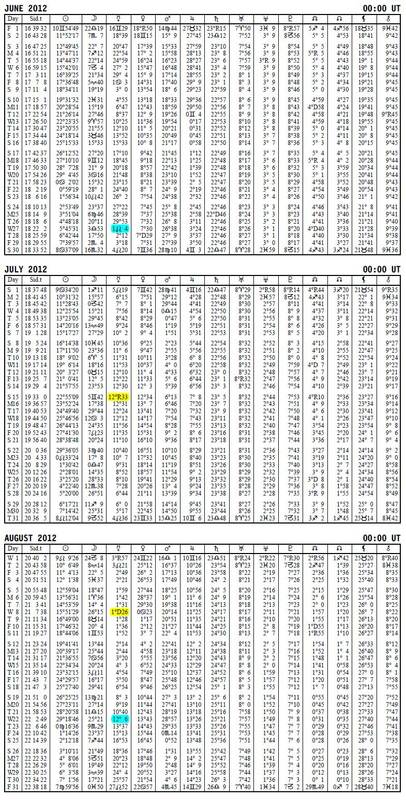 Shadow periods can be identified most easily by using an ephemeris. We will use excerpts from the Swiss Ephemeris below in order to demonstrate what shadow periods look like in that context (click the image to view a clearer version). 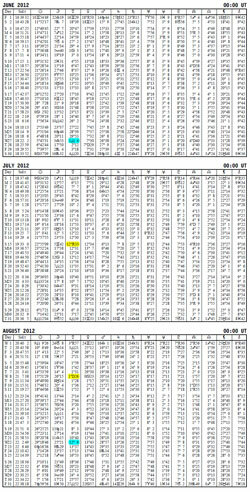 This ephemeris shows planetary positions for each day from June through August of 2012. Around the middle of that period Mercury went retrograde for three weeks. The degrees in which Mercury first stationed retrograde and then later stationed direct are highlighted in yellow. The date in which the pre-retrograde shadow period began is highlighted in blue, and the period in which the post-retrograde shadow period ended is also highlighted in blue. Notice that the pre-retrograde shadow period begins around June 27 at the degree of Leo that Mercury would later station direct at around August 8, and the post-retrograde shadow period ends around August 22 at the degree of Leo that Mercury originally stationed retrograde at around July 15. Note that the pre-retrograde shadow period last from about June 27, when Mercury passes the first shadow point, until July 15 when the retrograde actually begins. On the other hand, the post-retrograde shadow period starts around August 8, as soon as the retrograde period ends, and it lasts until about August 22, which is when Mercury passes the second shadow point. The important point is that during this entire period Mercury is passing over and staying within the same segment of the zodiac, and this is why these periods are seen as being connected. In this way the retrograde period is recognized as extending beyond just the three weeks of the actual retrograde, and instead it is made to include two additional periods before and after the retrograde itself.